SAN DIEGO -- Asked which event would be the best going into the 40th Mt. Carmel Invitational Saturday, meet director Dennis McClanahan paused. "Just one?" asked McClanahan, who has overseen what many consider to be the top early-season meet in the state since he started it 40 years ago. 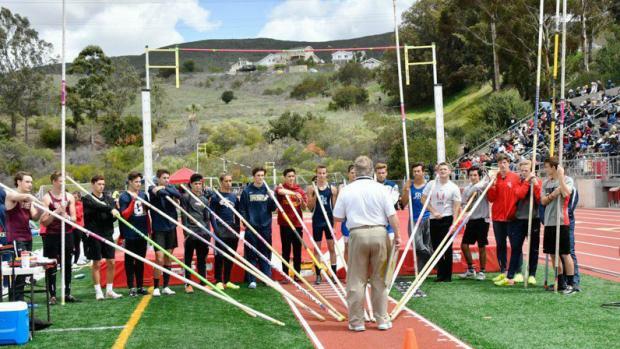 "OK, the pole vault -- and any event Coronado's Alysah Hickey is in." Notice he didn't say the boys or girls pole vault. That's because both events are loaded in a venue where a friendly tailwind (not too friendly, he hopes) is virtually guaranteed to bring out the best in loaded fields. For the girls, there are four vaulters who have already topped 13 feet and three of them are in the field led by co-state front-runners Paige Sommers of Westlake and Ashley Callahan of San Diego Rancho Bernardo, both of whom who have topped 13-4. 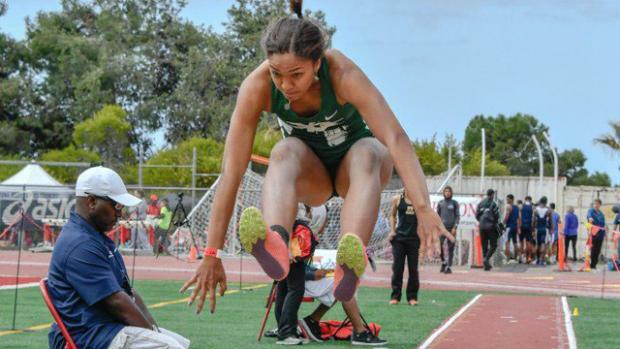 Add Redondo Union's Amari Turner and Poway's Camryn Thomson, each of whom have scaled 13-feet, and the meet record of 13-2 by two-time state champ Kortney Ross of Westview in 2010 is in serious jeopardy. Turner and Sommers, a sophomore, were second and third respectively at the State Meet last June. Of those, six have topped 15 feet with the consistent Rice adding numerous 15-6 clearances in addition to the Reno indoor mark that equals the best in the state this year. The 2018 state long jump champion, who had two leaps over 20-feet last week, one legal and one windy, and also leads the state in the high jump (5-10.50), where she was fourth in Clovis a year ago, and will be entered in what promises to be a scorching 100 if the weather cooperates. At the University City Classic last week, Hickey hit 20-feet-2 legally for a personal best and then got the crowd on its feet when she reached 20-feet-9 before learning the wind had gusted over the allowable 2.0-meters-per-second for record purposes. Too bad, since that would erased the final section record still on the books by Sweetwater High's Gail Devers who in 1984 reached 20-7. The main competition will be local 19-footers Jazmine Scott of Gompers and Kalani Hardyway of Oceanside. Moving over to the high jump, Hickey-who needs just three-quarters of an in higher for the section record-will have four competitors who have cleared at least 5-5 led by Harvard-Westlake's Tierni Kaufman, a 5-8 jumper last year. Interestingly, it's the 100 meters where McClanahan thinks the biggest noise might come. "Hickey won't be in too many races like this -- she could pop one," said McClanahan. 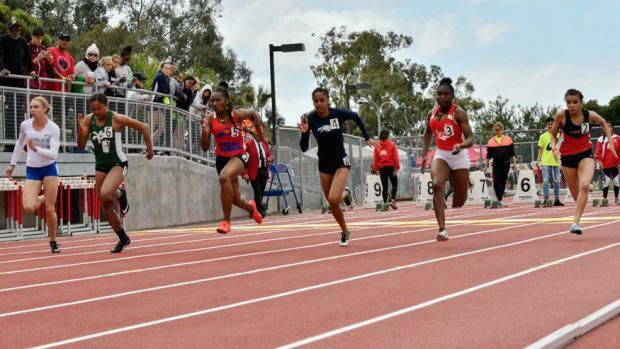 That's because the field includes Gardena Serra's state-runner-up Jazmyne Frost (11.57) plus San Diego San Diego Section champion Aysha Shaheed of Madison (11.95) to push Hickey (11.87). The boys' sprints might even be more intriguing. Madison's Kenan Christon (11.52 last week) meets state fourth place finisher Moray Steward of Escondido Orange Glen (10.64 last year) and current state leader Christian Grubb of Sherman Oaks Notre Dame (10.41). Christon, second in the state this year at 21.32, leads the pack in the 200 where Grubb has run a windy 21.45 and state finalist Izel Smith of Westview (21.63) makes his season debut after a highly successful soccer season. "The meet will have explosive starts and finishes with the two relays," promised McClanahan. That's because in the girls' 4x100, Long Beach Poly tops three teams that are possible sub-47 quartets, led by a Scripps Ranch foursome that has already gone 46.95. In the final race of the day, Harvard Westlake, Long Beach Poly, Long Beach Wilson and La Mesa Helix lock horns in the boys 4x400 with a sub-3:20 virtually certain. Not a bad early-season lineup with 103 schools, 71 from San Diego, 30 from elsewhere in CA and two from out of state.